Welcome to this stop for The Farmer's Wife 1930's Sampler Quilt QAL hosted by the lovely Kerry of verykerryberry. Here is my block #80 Patricia. 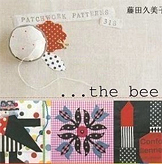 I made it using paper piecing patterns in the CD that comes with this book. 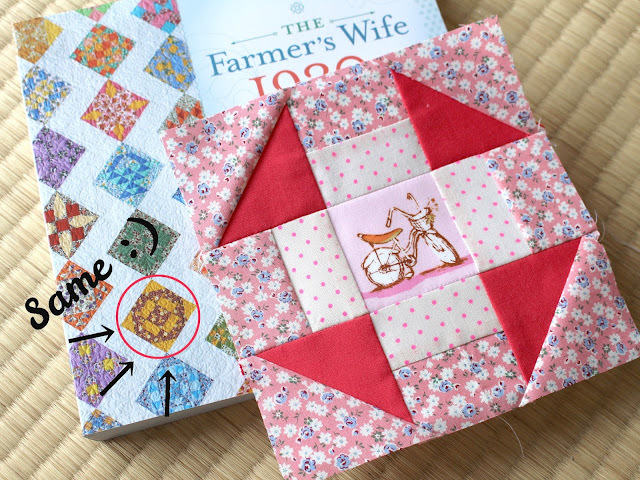 I didn't look at the beautifully finished block in the book until I was done with mine only because I enjoy a surprise :) We all know the same quilt blocks can look completely different depending on your fabric combinations and how you put them together. So I didn't know that this block, Patricia, was actually one of the blocks on the book cover until I looked inside the book! It looks pretty different, don't you think?! This is why patchwork is so much fun - endless possibilities! I had so much fun making this and can't thank my sweet friend Kerry to have me be a part of this journey. 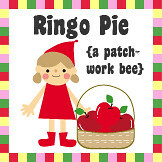 This gives me such a great opportunity to make something beautiful and to bring me back the joy patchwork can give me. What positive, uplifting energy! I have been terrible at keeping you updated. I am so sorry about that! Things are much less hectic here in this household. 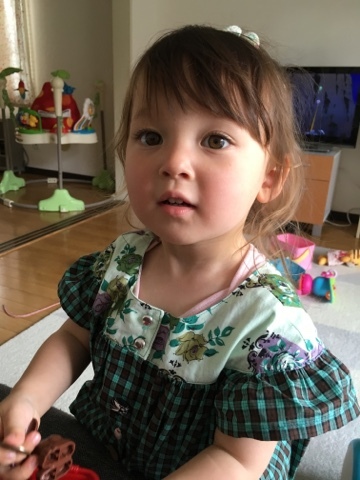 Honoka is almost three. When she was going through terrible twos, she was like a little crazy monster but now she is a sweet little girl. 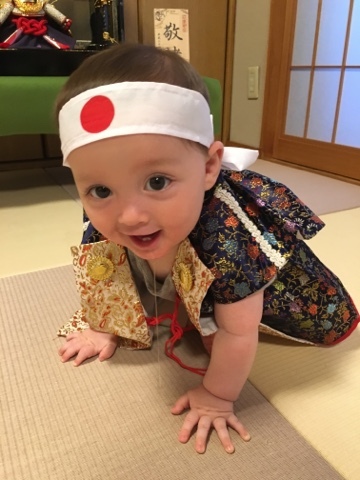 Hayato is 9 months old. He is much less colicky and is quite adventurous and mischievous! I am finally starting to feel more in control and to learn tricks to squeeze in some sewing time here and there. Like many of you kind friends have kindly let me know, it is only a matter of time until I will have more time, energy, and confidence to sew. 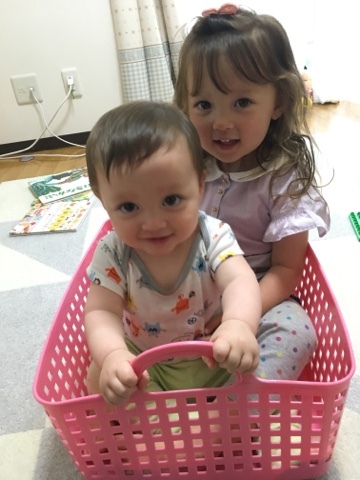 I will be enjoying this time when my kids are little, adorable, and crazy as much as I can :) Seeing them grow daily is just beyond thrilling. If you are reading this because you are subscribed to it, thank you so much for not forgetting about me! I really hope to come back to blogging more often. 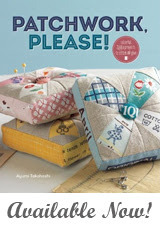 Dear Ayumi, it is such a delight to see this post! 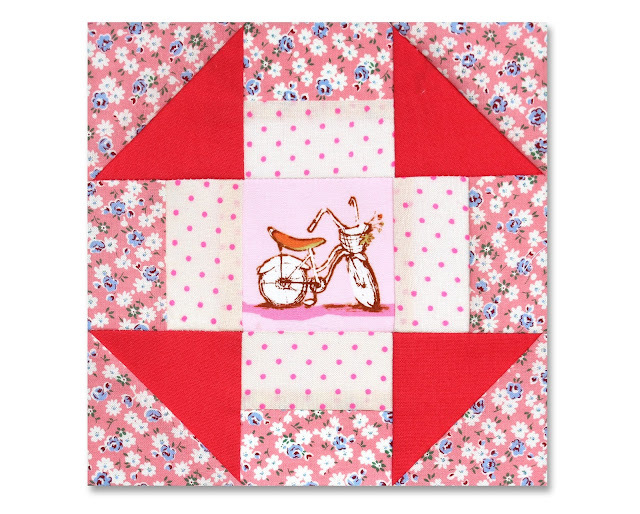 Of course, your quilting is as lovely and imaginative as ever. Ah, to see how your family is growing is quite wonderful! 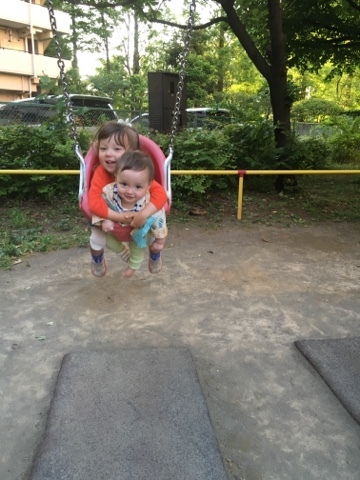 Good to see big sister Honoka showing little brother Hayato how to explore. The photographs show such joy and beauty...bravo to you and your husband. Realizing just how busy you must be, so thank you again for this post. We need a pic of you on the bike with the kids - that must be some fine exercise for you. It's lovely to hear from you and to see your sweet family thriving! While we miss hearing from you more often our hearts are warmed at your choice in priorities. "...no other success can compensate for failure in the home." Our children grow far too fast and those sweet, precious baby moments are gone to exist in memories. Love, care for, and enjoy your family, and sew when you can. Be blessed! It was wonderful to hear from you again but I applaud you for taking the time with your children while they are young - that time will never come again. Look forward to future postings when you can, the block was lovely. Blessings! 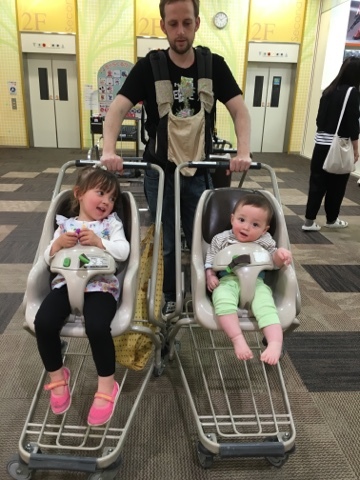 Dear Ayumi, it is so great to get an update on your blog. I think most of us agree, we will never let you go. We know you are busy and happy. I know you will get bits of sewing in. I love seeing photos of your silly baby clowns. It is so great to see that you are a mommy. God has blessed you. This is a time to treasure. I am a gramma now!! My oldest daughter has a one year old Sarah now, she is so silly and cute. I am sure she will be keeping my daughter very busy. Every time I pack my lunch and have to place my silverware in the container I think, "I bet Ayumi would have some sweet Zakka solution for this." I am glad to see your post again. 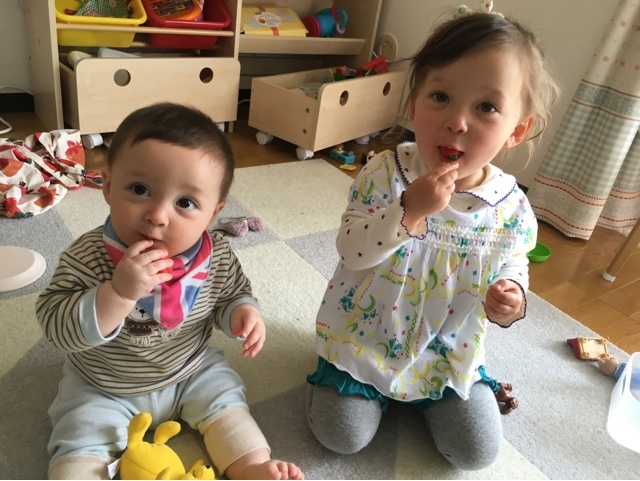 It was so nice to hear from you Ayumi, I understand that you have to get advantage of being with those lovely kids, just keep in touch sometime, anyway we all still use your fantastic tutorials until you will be able to come back fully to blogging! ENHORABUENA.... TIENES UNOS NIÑOS ADORABLES.... UN SALUDO DESDE CADIZ, ESPAÑA. Loved seeing your post today! I check in often just in case you've returned... I am so glad you are enjoying motherhood--your children are beautiful (and so is your Farmer's Wife block! Thanks for sharing it with us! omg! Your kids are so cute lol...it looks like you really have your hands full! Good to see you back Ayumi, stay well! Enjoy you children whist they are young, they grow up all too quickly. I always enjoy your blog posts and seeing your design skills. That block is just gorgeous! So are the children! How fun to see your family again. Glad you are doing well! Great to hear you are taking your time with balancing out home life. It doesn't get any easier and it feels like you have less time even when they get older. They are adorable and yes take some videos and pictures all the time. I love looking back at my kids when they were young and I wish sometimes I could go back to it all but I'm good. Looking forward to summer with my kids who don't need me as much so I do have a bit of my own time too. Take care! Oh it is so nice to read your post! I love your fabric line and seeing your patterns pop up around instagram. looking forward to seeing more from you in the future, for now enjoy your babies!